Zhenyu "Henry" Huang (left) and Gregg Lumetta (right) were named PNNL Laboratory Fellows. 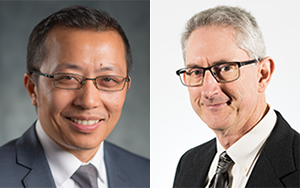 Pacific Northwest National Laboratory recently added Zhenyu "Henry" Huang and Gregg Lumetta to the PNNL Laboratory Fellow ranks in well-deserved recognition of their career accomplishments. Huang is recognized for his scientific and engineering contributions in integrating advanced mathematical techniques and high-performance computing to significantly advance power grid modeling and simulation. His innovations are well recognized by industry leaders and have been incorporated into industry standard tools. He also is a Fellow of the Institute of Electrical and Electronics Engineers. Lumetta is recognized for his pioneering research in nuclear waste chemistry, complexes of f-element ions with novel ligands, and diamide extractant binding modes and stoichiometries. He has made significant impacts in the fields of environmental management, non-proliferation, forensic signatures, and nuclear energy. Gregg received the DOE Secretarial Honor Award for salt waste disposal in 2013 and the Glenn T. Seaborg Actinide Separations Award in 2015. He was also appointed a Fellow of the American Chemical Society in 2011. Laboratory Fellows have established national and international reputations over careers of sustained, highest-quality research and development in science or engineering. The quality and impact of Laboratory Fellows' work have been validated by peers, including external reviews by experts in their respective fields. Laboratory Fellows are appointed by PNNL's Laboratory Director based upon recommendations of a review committee of Laboratory Fellows representing all research directorates. A Laboratory Fellow serves as a scientific and technical advisor to the directorate's management team and is looked to for developing cross-directorate science and technology strategies. Learn more about PNNL’s Laboratory Fellows on the PNNL Senior Research Fellows webpage.